Daingean Ui Chuis is Irish for Hussey’s Fortress. The English anglicized it to “Dingle.” A small harbor town on the breathtakingly beautiful Dingle Peninsula, we fell in love with this place five years ago when we did a two-week tour of Ireland. We always said we’d be back. After two weeks of a whirlwind tour of England, a week in Dingle was just the ticket. We flew from Manchester, England across the Irish Sea to Cork, Ireland, picked up yet another rental car, and drove about 2 hours to get to Dingle. Instead of a B&B as we had done the last time we were here, we rented a small cottage from John Benny Moriarty, the proprietor of one of our favorite pubs in town. Set back from the main street, the cottage was quiet while providing easy access to everything. The back entrance through the garden door opened on to a pasture filled with yellow irises where two herons were in residence the day we arrived. Front window of the cottage. Our plan for this week was to have no plan. The town is famous for its traditional Irish music which can be heard in many of the pubs around town starting at around 9:30. We would do whatever we felt like during the day, and then go hear whatever music we could find by night. After two weeks in small hotel rooms and B&Bs, the two-story, two bedroom cottage was the lap of luxury. We went shopping at the local market and picked up provisions (tea, breakfast makings, wine….) and settled right in. Our first day we walked around town to visit the places we remembered and to see what had changed. Very little, it turned out. We stopped into the Dingle Record Shop, run by Mazz O’Flaherty who we had met on our last trip. Mazz comes from a musical family and her brother, Fergus, owns the oldest pub in town, O’Flaherty’s. An indefatigable supporter of local music, we let Mazz steer us to a handful of CDs by local musicians which we happily took back to the cottage to play on the CD player in the living room. The Dingle Peninsula is part of Ireland’s “Gaeltacht,” districts where the Irish language is predominant. 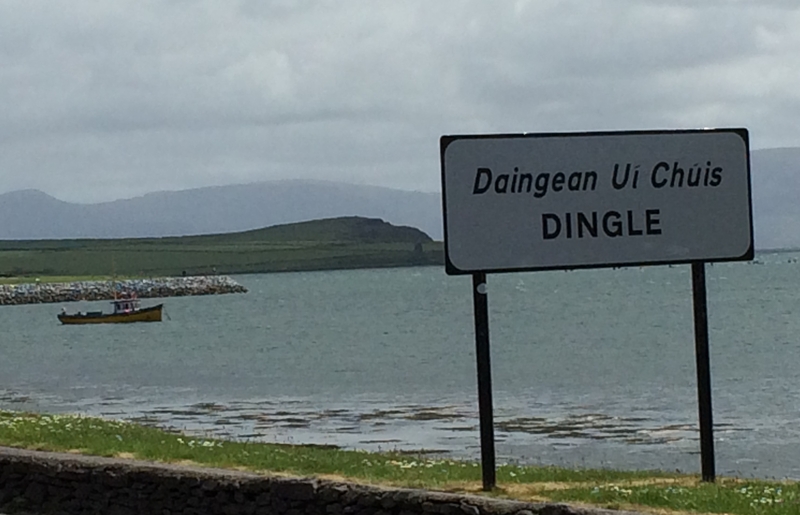 Most people in Dingle are bilingual and many speak Irish as their first language. The Irish government is trying to preserve the Irish language throughout the country, but it is an uphill battle. Schools are required to teach it, and the Constitution states that Irish is the official first language, but the reality is that most commerce and government business are conducted in English. In Dingle, though, you will hear Irish spoken daily and most of the shop signs are in Irish. Hopefully it will continue to hold on to this critical piece of its heritage. The town of Dingle is set on a hill side and consists of three main streets that intersect into a triangle, joined by a few smaller streets. Brightly colored houses and shops wind along with the streets. The biggest church in town is St. Mary’s, the Catholic church. But we had the good fortune to hear a concert at St. James, the local Anglican church. Much smaller than St. Mary’s, it is beautiful in its simplicity. Built around 200 years ago it was neglected for many years but then restored in the 1970s. St James. Church of Ireland. We’re told that Dingle has over 50 pubs. We’ve never managed to count them to verify, but they do have a lot. Not all pubs are just pubs. 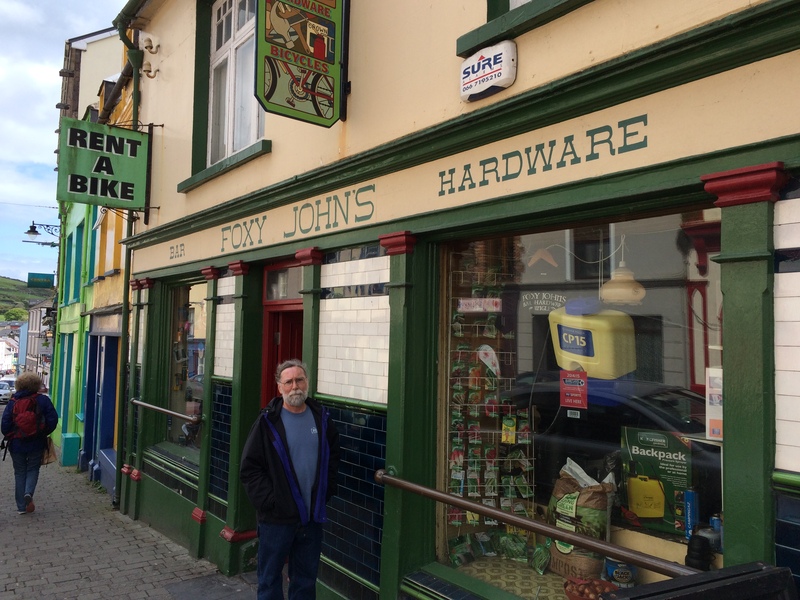 It is not uncommon for a hardware store, or clothing store, to double as a pub. These tend to be the pubs tourists don’t go to, so, of course, we love them. Never mind the odd glances we get from the local guys having a pint, they always seem happy to have us. And then, of course, there is the harbor itself. Dingle has an active fishing economy and the boats come in every day with whatever is fresh. Cod, haddock, hake, and all manner of shellfish come out of Dingle Bay. 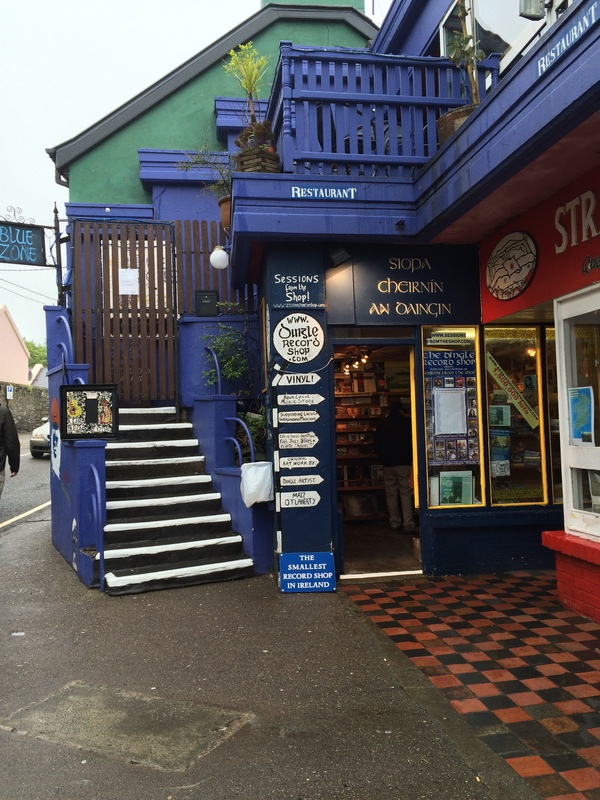 Some of the best seafood we’ve ever had has been in Dingle! We went twice to a favorite restaurant from our last visit, Out of the Blue. It is a “seafood only” restaurant and the menu changes daily, depending on the catch. As they say, if they don’t catch anything, they don’t open. We did not have spectacular weather the week of our visit to Dingle, but we found that it didn’t matter. We spent one particular rainy day inside the cottage with a fire in the fireplace, listening to Irish music while lamb stew simmered in the kitchen. Over the course of the week we did take many walks in many different directions, getting a lot of great views of the countryside. Like most of Ireland, Dingle is very rural, with the landscape covered by sheep pastures. The views are stunning — with every shade of green in every direction.